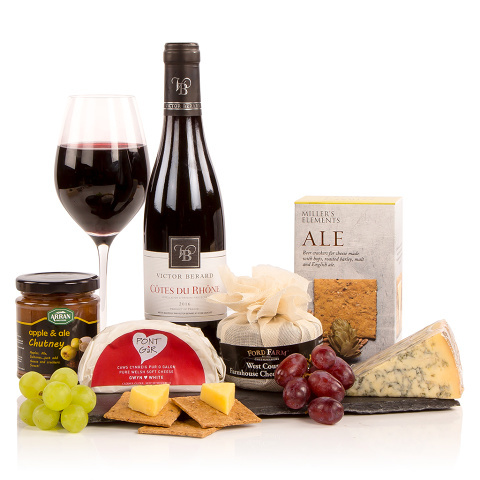 The Wine and Cheese Slate comprises three scrumptious cheeses, a jar of Arran chutney, Miller's ale crackers and an excellent half bottle of red wine. Each cheese is delicious in its own right; the Ford Farm's Cheddar is strong, tasty and ever so slightly crumbly; the Pont Gar Welsh White Cheese is soft and creamy, as is the Long Clawson Stilton. Ford Farm West Country Farmhouse Cheddar Cheese Truckle 200g ? Long Clawson Blue Stilton 220g ? Pont Gar Welsh Soft White Cheese 125g ?